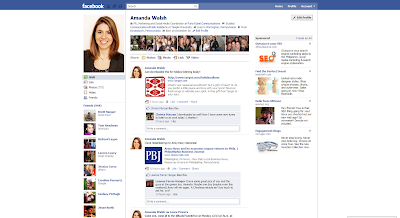 The PR Lawyer: Facebook Redesign News: What Do You Think? 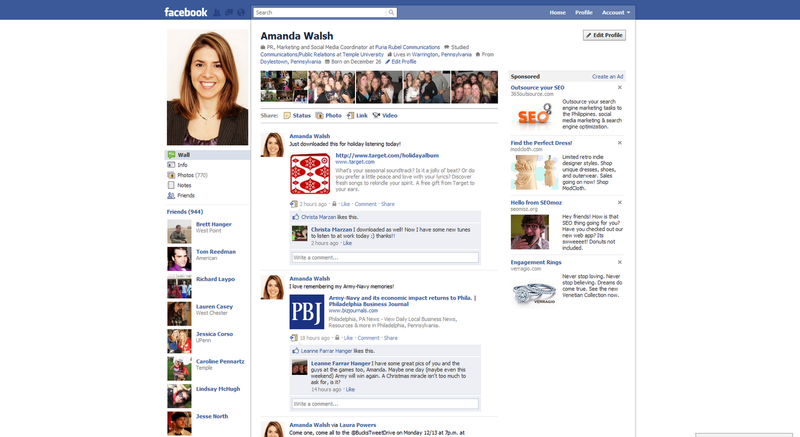 It's been a full week with the new Facebook profile redesign. If you haven't heard about or noticed the changes, I put together some screenshots and links for more information. Below is a screen capture of my new profile page. Notice at the top there is a film strip of my photos and on the left-hand side my friends are listed. The new redesign puts your information at the top of the page including where you work, where you studied, where you live and birthday. In addition, randomly-chosen, tagged photos have been moved to the top of the profile page as well. When you look at a friend's profile, the share bar (below) pops up. In order to write on their wall, you need to click "Post". This may be an extra step in the process of writing on someone's wall, but I don't find it too annoying. I personally like the new redesign. I believe it streamlines profiles and put interesting information about a person at the very top of the page where it catches your eye. I've noticed on some blog comments that people aren't thrilled with the change. Some say that where you live and work is information that your friends should already know about you. Also, users are commenting that status updates are most important. Many don't like the random photos that come up in the filmstrip at the top. In the past, when Facebook has made changes to design, there has inevitably been a backlash from some users. Time will tell how Facebook weathers another design change and the opinions of its millions of users. Here are some links to learn more about the changes to the Facebook profile page. * Sixty Minutes Broke the News on Sunday December 5. CEO Mark Zuckerberg did an on-camera interview with Lesley Stahl. What do you think about the new redesign? Thanks for your article about the new look of Facebook. I'm hoping that they will tweak the new profile in the coming days. First I would like to sing the praises of Facebook overall, as I have had measured success in business because of it, plus reconnecting with people is great, not to mention that it's free. However, I noticed 3 observations right off the bat that I don't like on the new redesign. Ok, make it 4. 1. Status updates are no longer at the top of your wall, and get buried as posts appear on your wall. I believe the status update is one of the most important aspects on Facebook, and I would like it to be visible at the top at all times. 2. Facebook has made their ads on the right side wider, encroaching on the middle of the wall. This is their right of course, but it's starting to look squeezed. 3. I think the tightly cropped photos along the top look clumsy. 4. There seem to be some bugs, like notes not being shown on the wall when imported from a blog, or, shown once, then buried in the notes tab, or shown repeatedly on the wall which looks clumsy. Specializing in fresh marketing solutions for creative businesses. I'm still getting used to the new redesign and agree with some of your points, in particular the new placement of status updates. It will be interesting to see how Facebook handles the bugs with notes and imported RSS feeds, especially in the new year!